Advance the field of immunotherapy to harness the immune system to fight disease. 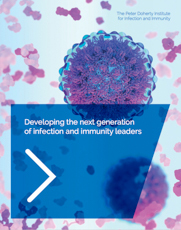 Click here to learn more about our work in infection and immunity. If you are thinking about a donation that could make an important difference through education or research, we welcome a discussion on how the benefits of your gift will be realised for many years to come. As a joint venture between the University of Melbourne and The Royal Melbourne Hospital, the University of Melbourne collects funds on behalf of the Peter Doherty Institute for Infection and Immunity. The receipt for your gift will be issued by the University of Melbourne. Donations of $2 or more to University of Melbourne initiatives in Australia are tax-deductible for Australian tax payers. ABN: 84 002 705 224. To make a donation, click here. You will be redirected to the University of Melbourne website to complete your donation. We have teams of brilliant scientists, clinicians and public health experts approaching some of the greatest health challenges of our time. Real advances, however, depend upon engagement and leadership from beyond the scientific community. Delivering on the promise of the Doherty Institute requires an unprecedented level of commitment across sectors and borders alike. We invite you to join us.